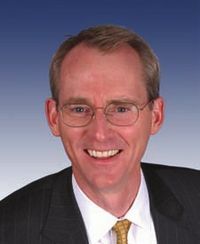 Robert Durden "Bob" Inglis, Sr. (born October 11, 1959 in Savannah, Georgia) is the former Republican U.S. Representative from South Carolina's 4th congressional district, a RINO who was defeated in his own primary in 2010 by a virtually unprecedented landslide of 71-29%. Inglis lost in his 2010 reelection primary to district attorney Trey Gowdy. Inglis received criticism from conservatives for voting for a Democratic resolution opposing the 2007 military surge in Iraq and voting in favor of the Emergency Economic Stabilization Act (TARP). After the election, Inglis suggested that Tea Party favorites such as former vice presidential nominee Sarah Palin and conservative talk show hosts like Glenn Beck were the cause of his defeat.